When the Iris benefits debacle appeared the other week, not everyone got the joke. Iris probably felt they should be given the benefit of the doubt, but something about it hit home for me. For those who didn’t see it, it went something like this. 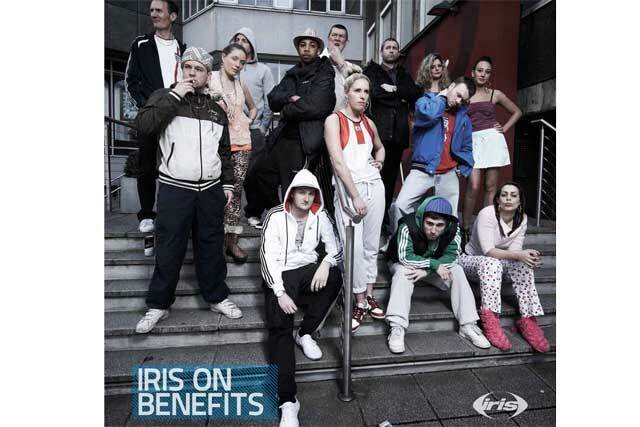 The agency Iris wanted to communicate to its staff its internal financial benefits. It decided to package the information up in a style that, if we were being kind, paid mock homage to people commonly believed to ‘rely’ heavily on benefits of a state-funded nature. Cue photos of staff members dressed as ‘chavs’, replete with effete Sid Vicious sneers and loafing about somewhere suitably estate-like. Apparently they were riffing off Shameless. But it was, to put it mildly, a little unedifying. Naturally the advertising echo chamber briefly resounded with outrage and perhaps just a teensy bit of schadenfreude. OK, more than just a teensy bit. I don’t know what the motivation was for the idea. Was it an affectionate parody that unintentionally came off as mean? Perhaps they just rely too much on word-association techniques in brainstorms? Try as I might I can’t see either how it would get through the inevitable layers of bureaucratic approval that probably exist in any agency. But get through it did. And the shitstorm ensued. Well, my first thought was that if Iris wanted to tender its notice to refuse any future government business then it couldn’t have come up with a more public way of doing it. Because nothing shows you don’t get an audience like caricaturing it. Sure there’s a cultural short-hand they were taping into. And it’s not like government is some sort of brand who might be pissed off because Iris had mocked its core constituency of consumers. But government work – at least some of it – is where you’re called upon to understand audiences that are, if not quite at the extremes of society, then perhaps at the furthest reaches of advertising’s usual territory. And government is not interested in short-term market share or image recall. They want long-term, self-sustained behaviour change. Often overcoming entrenched and harmful behaviour. For that you need to truly understand what makes these people tick, using both the widest possible lens and a forensic eye for detail. And I’m not sure that capitulating to inherited stereotypes and lazy caricatures shows an agency’s capability to do this in the best light. But I can’t imagine any client would want to see this sort of thing from one of their agencies. An agency’s job is to mediate between a brand and its customers to bridge this divide in vivid, meaningful ways. To get beneath the surface of an audience you need to understand them as people. I fundamentally believe you can’t do that with a superficial prejudice about who individuals or groups with the audience are. Which means letting go of whatever it is you think you know about people. Doubt your prejudice. It will benefit us all.